Under construction - Aerotech makes outstanding rockets well suited for model rocketeers wanting make the transition to mid-power rocketry. It can also handle an H motor, making it a viable kit for anyone seeking their Level One certification. 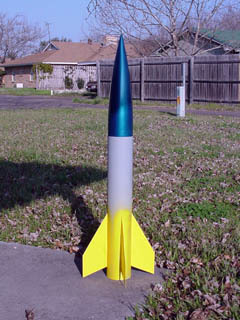 The Sumo is Aerotech's second rocket venturing into the 4 inch diameter category. It shares much of the same hardware with Aerotech's largest kit, the G-Force. The Sumo appears to be Aerotech's first model using a piston, rather than their labyrinth baffle system. A common complaint among other reviewers has been that the piston ejection coupler was too tight. My kit was no different. I felt it would be too much work to correct this. Instead, I chose to abandon the piston concept and use the coupler to reinforce the aft section of the airframe. The Sumo comes with an outstanding decal sheet. The best of any kit I've purchased. There's one minor problem. Certain portions of the decal are transparent and rely on the underlying paint for color. This means it only look right using the stock red and yellow paint scheme. A blue or teal paint scheme will produce a queasy looking sumo wrestler.